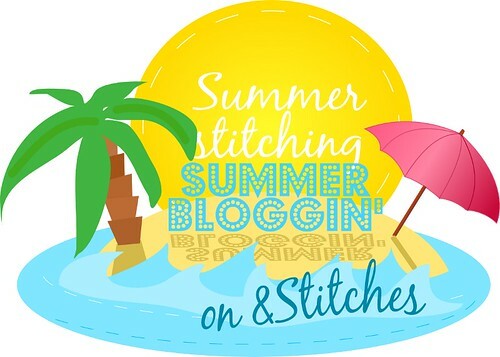 Today, as our first of the 2015 Summer Bloggers, we welcome Amy Byrne of Random Acts Of Amy! 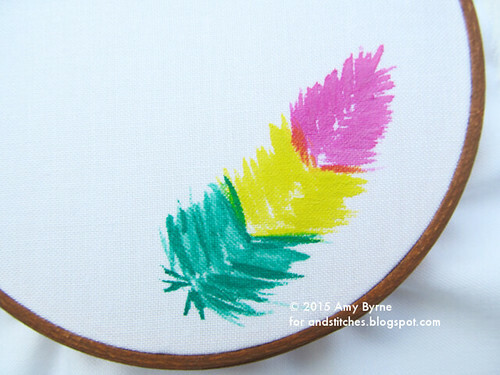 Today, Amy will share her method of incorporating watercolors into embroidery - thanks so much for joining us, Amy! I tend to get my best ideas for embroidery as I’m falling asleep. Depending on how tired I am, I will either pop back up and write it down, or I’ll go to sleep and hope I remember it in the morning. In this case, I went to sleep while telling myself that I really needed to remember this in the morning. 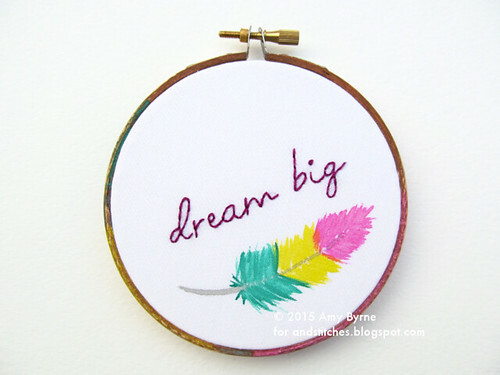 I ended up dreaming about painting on fabric and then using embroidery to enhance it – what a great dream! Once I woke up, I couldn’t wait to get started. I decided to use watercolor paints in order to get various coverage on the fabric. And, speaking of fabric, I used a lush cotton fabric by Moda that is not too thick, and not too thin. After practicing with three different types of watercolor paints, I’ve discovered that my favorite is the middle in the picture below. They are Artist’s Loft brand, and I got them at Michaels craft store. I found that I had a better time at getting a great consistency of paint and water. The watercolors in the tubes are great when I want a thicker color since I can really manipulate how much paint I use. And the Prang watercolors (like I used in grade school) create really vibrant colors. I really like feathers, and they are super popular in home décor and accessories, but I am oh so allergic to them. Like my throat starts to close up allergic when I’m around them. So in order to have feathers around, I have to get creative in how to make them. 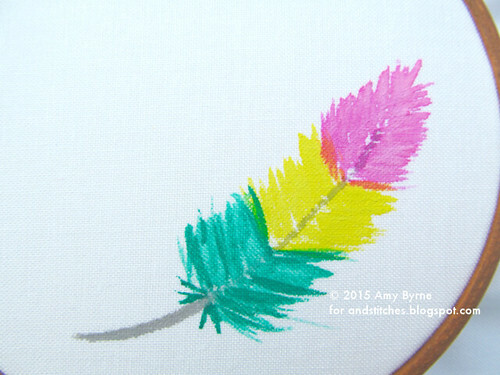 I’ll walk you through the steps I used to create feathers on fabric with watercolor paints. 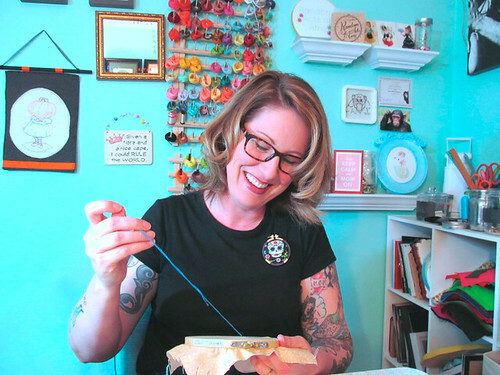 I recommend that you practice on a scrap piece of fabric before moving on to your project. That way you can figure out your water to paint ratio. 1. 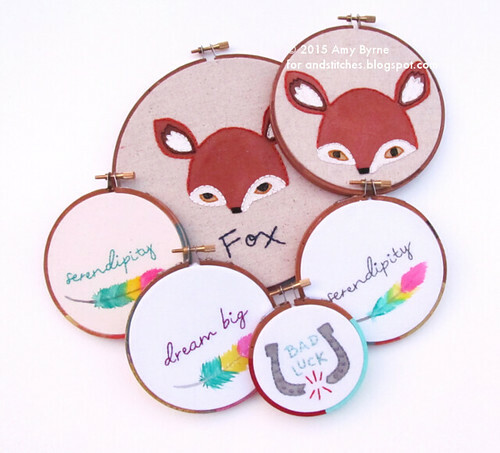 Stretch your fabric taut in an embroidery hoop. 2. Get a good amount of water on your brush. I use a paintbrush that is tapered on the end. Swirl it around in the paint, and then lightly dab the paint onto a paper towel before touching the fabric. This gets rid of the blob of paint water on the end, making for a finer line. 3. Start by sweeping up in the center, and then out in V shapes on either side. Pretend that there’s an imaginary line running up the middle that you’re creating the V shapes off of. This will later become the shaft of the feather. 4. Using less water and more paint, make some wispy lines so that it doesn’t look like a blob. You’ll do this technique on all parts of the feather. I like to use two or three colors on my feathers. In this example, this is where I will lay down my second color. Keep making V shapes from the imaginary center line. Repeat the above steps with the third color. When you’re finished, make a few little lines that V away from the feather. I use a very watered down grey to create the shaft of the feather. What I do is sweep down, slightly curved at the base of the feather and make the shaft thicker towards the top, and narrower at the bottom. I then sweep a line up through the center of the feather to finish it off. Wait for the paint to thoroughly dry, and then add some embroidered text. I like to stain my hoops, and I often paint stripes of paint onto the hoop that coordinate with the piece. I then scruff the hoop up with sand paper to give it a vintage look. 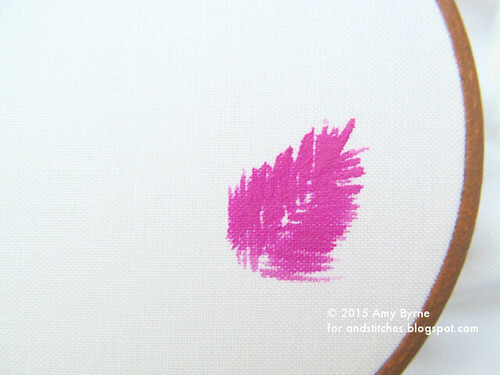 You can also use this same technique on an iron on pattern or a pattern you draw or trace on the fabric. 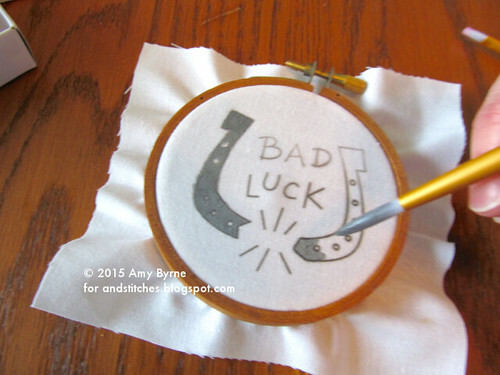 I used this fun iron on from Sublime Stitching to show you how it’s a little bit different. When using this type of pattern, you want to make sure you try to stay within the lines. 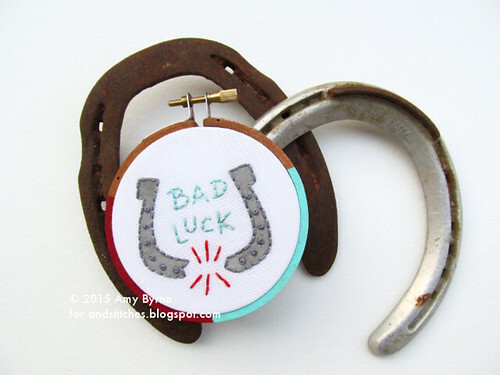 If you have any spots like I do within the horseshoe where I want to put French knots, try not to paint over them. It makes it easier to see those spots when it’s time to embroider. 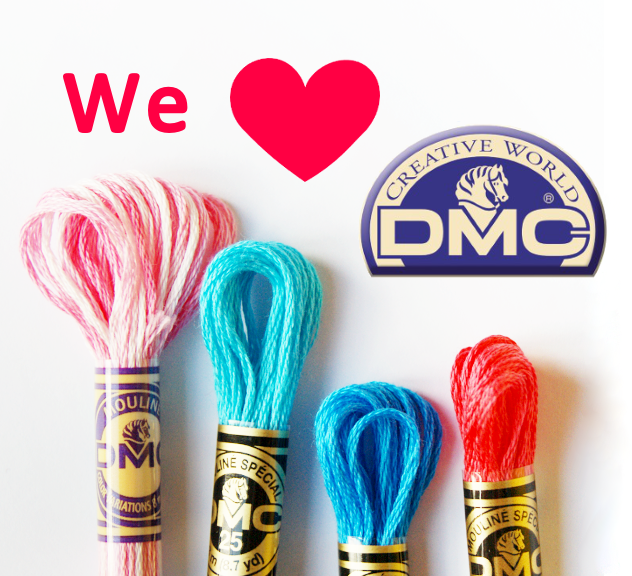 Make sure the paint is completely dry before adding the embroidery to the rest of the design. On this hoop I used paint to color block the hoop, and then permanently mounted the piece to it. 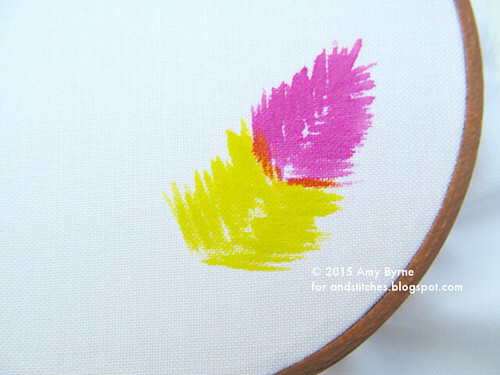 In addition to adding focal elements (like the feather) or painting in patterns, it’s also fun to completely cover the fabric within the hoop in paint, like I’ve done on this work in progress below. I used several shades of blue and green to create the sky and hillside, and the white paint in the palette I use created the clouds, which I added after laying down the blues. I’ll add more French knot flowers to the hillside to cover it in flowers, and some fuzzy specialty floss to the clouds to create even more dimension. 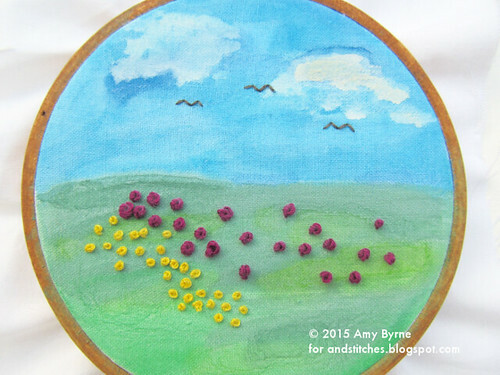 I hope that this has inspired you to try out combining watercolor paints with your embroidery. It’s a different kind of technique, and it’s one that’s a lot of fun. I like to add watercolor to my embroidery as a way of giving the finished pieces more depth and dimension without using a filling stitch. What a brilliant idea! 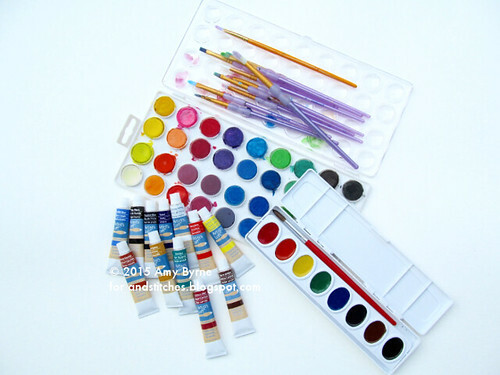 I know what I'll be doing during the summer holidays...playing with paint! I also love love love your hoops, I've painted mine but never considered distressing them or owing blocks of colour - simply fabulous! Thank you, Chrissie! I can't wait to see what you make! This is such a great idea! I had no idea watercolor would work so well in fabric.